Isle of Wight NHS campaigners pledge support in Supreme Court case. Controversial changes to NHS funding are unlawful, they believe. Plans to scrap the Cross Solent Travel Scheme will "put people’s lives at risk and strike fear in the hearts of many, who are already physically and emotionally compromised by their diagnosis of Cancer or kidney disease", say health campaigners. IOW Save Our NHS Group believe the consultation survey on scrapping cross-Solent travel for the most vulnerable is "flawed and that it is limited, leading and misleading" and say it has not been publicised widely enough by IWC. The public meeting proved very productive and resulted in more volunteers to help with the campaign to protect health services on the Isle of Wight. This film lifts the lid on what lies behind the NHS crisis, hears from doctors about the Americanisation of the NHS and gives a forthright and candid explanation about the marketisation and privatisation of the NHS. 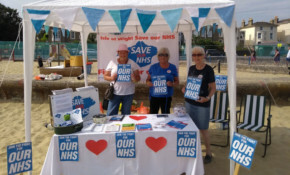 Members of the IOW Save Our NHS Group travelled across the Isle of Wight this week, collecting signatures for a giant birthday card that has now been presented to St Mary's hospital, and spreading the word of the upcoming public consultation. Look out for the giant birthday card making the rounds of the Island this week to be presented at Wednesday evening's event in Newport. 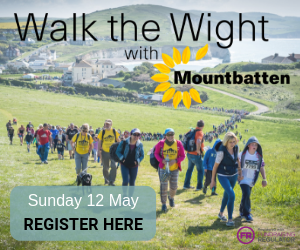 Join others travelling from the Isle of Wight to take part in the massive day of celebration and demonstration for the NHS 70th birthday in London on Saturday 30th June. Did you have your photo taken over Easter to show your support for the NHS? Christine from IOW Save Our NHS Group shares concerns for future of NHS provision. Save Our Isle of Wight NHS groupp teamed up with the Melodic Choir for three Flashmobs in Newport on Saturday - watch videos of the events that were aimed to raise awareness of several issues. The IOW Save our NHS Group say we cannot just sit back and allow government policies to dismantle our NHS and hand it on a plate to the likes of Virgin Care. A march takes place on 3rd February from the hospital to Newport centre. All are welcome. Find out more about the impact the Sustainability and Transformation Plan could have on NHS services on the Isle of Wight. Tickets are free but you need to book in advance to secure your seat.